Gokyo trekking is one of the popular trekking trail in Everest region. Gokyo trekking is known as Gokyo valley trekking to explore the Gokyo peak, Gokyo lake and Everest region Himalayan views. Since Gokyo trekking trail has been open Himalaya Journey Trekking & Expedition ( Ram pahari - Nepal trekking operator ) has depth experince to arrange the trip in relevant area.The Gokyo Ri trek starts from Lukla after 35 minute mountain flight from Kathmandu, following up the Dudh Koshi river valley towards Namche, and other main villages of Khumbu, Thame & Khumjung. After Khumjung Valley we branch off from the main busy trail towards the sleepy village of Phortse Tenga and finally reaching to our ultimate destination at Gokyo. 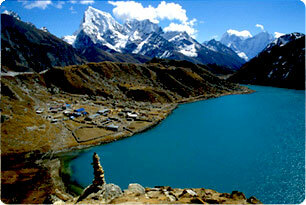 Gokyo, a one time yak pasture is blessed with two beautiful high lakes. Gokyo trekking explore beautiful Gokyo valley & lake. The mountains are more spectacular, the Ngozumpa Glacier is the largest in the Nepal Himalaya and from a ridge above Gokyo, and for 8000m peaks (Cho Oyu, Everest, Lhotse and Makalu) are visible at once. The view of the tremendous ice ridge between Cho Oyu and Gyachung Kang (7922m) is one of the most dramatic panoramas in Khumbu. There are many options for additional exploration and high-altitude walking, including the crossing of Cho La, a 5420m-high pass into Khumbu however we will not cross this pass in this trek. We will come back to Lukla almost a same route.The trek starts in Lukla. Clients carry daypack only and walk at their own pace. Starting from: Lukla 30minetues fly from Kathmandu. Highest access of the trek: Gokyo Ri 5350 Meters. Himalayan sights: Mt. Everest,Mt. Cho Oyu, Mt.Amadablam, Mt.Thamserkhu,Mt. Nuptse, Mt.Lhotse etc. Splendid breath taking place: Gokyo Lake and touch of the Mount Everest. Day 01: Arrival in Kathmandu (1334m), transfer Hotel,Gokyo lake trekking briefing with officially arrangments. overnight at kathmandu. Day 02: Katmandu by flight to Lukla (2830m) and trek to Phakding (2630m). Day 03: Phakding trek to Namche Bazaar (3480m). Day 04: Namche Bazaar acclimatization day. ( During the day , you can hike to Thame for beautiful Himalayan views, wild animals and Tibetan Monastery or hike to Everest view hotel for superb views of Mt. Everest( 8848m) , Mt.Lhotse, (8516n) Mt. Nuptse, (7855m), Mt. Amadablam (6856m), Mt. Thamserku ( 6723m) , Mt. Kantega (6979m), Mt. Kusum Khangaru ( 6367m) , Mt.Kongde (6011m), Mt. Tawache peak ( 6367 m) , Mt. Cholaste (6335m) ,island peak (6179m), Khumbila (God of Khumbu) 5761m etc , overnight at Namche Bazaar. Day 14: Lukla to Kathmandu by flight . Day 15: After breakfast, our tour guide will take to for historical monuments sightseeing in kathmandu valley such as Boudhhanath : visit Bodhnath Stupa, one of the biggest Buddhist shrines in the world, where we observe Buddhist monks in prayer in the monasteries surrounding the stupa than visit Pashupatinath: the most famous Hindu temple in the country, located on the banks of the holy Bagmati River. Here you see Hindu holy men (sadhus) meditating, pilgrims bathing and occasionally funeral pyres burning on the ghats. Bhaktapur: you will enjoy with different spectacular Himalayan scenery , old architecture, 55 windows, Pottry farm, king curd and old style primitive houses. Kathmandu durbar square: you will enjoy with different Hindus Temple, Goddes Kumari, legend of kathmadu valley.Monkey temple(swyambhunath): you will enjoy with Budhhist stupa from where you will see whole kathmandu valley view including the Himalayan views ,Patan Dubare square: Patan city is the temple city of Nepal where you will see the many temple,Mahabudhha , Golden temple etc and in the evening farewell dinner in Nepalese Restaurant, overnight at kathmandu in Hotel. Day 16: After breakfast, relaxing or shopping with own activities than drop to international airport for onward destination.